Morgen besteht ein hohes Unwetterpotential über der Nordhälfte Deutschlands. Auch NRW ist betroffen. Die genauen Schwerpunkte lassen sich nur sehr schwierig vorhersagen, da es auch aktuell noch größere Modellunsicherheiten gibt. Wenn es Gewitter gibt besteht aber die Gefahr von Hagel um 5 cm oder (lokal) mehr und Böen bis Orkanstärke. Auch ein geringes Tornadorisko ist nicht von der Hand zu weisen. Das Starkregenrisiko ist wegen der schnellen Zugeschwindigkeit der Gewitter aber verhältnismäßig niedrig. The main flow pattern is governed by a broad ridge that stretches form Morocco to western and CRTL Europe, which is sustained via thickness advection ahead of a quasi-stationary W-Atlantic trough. As a result of a cut-off, a well defined PV-lobe (which until now was vortex-trapped in the trough) gets catched by the strong mean flow south to an Iceland-low and travels eastward. The PV-anomaly can beautifully be detected by the help of WV satellite imagery. It manifests itself as a sharp secondary trough in the 500 hPa geopotential field and will play a major role in the today‘s setup. The thermodynamical analysis of the PV feature shows no phase locking either with a lower theta- or a latent generated anomaly, so that it remains constant in magnitude. Thus, it can be interpreted as a decoupled upper level low. This information is important to understand the missing of a surface low in the vicinity of the upper PV anomaly. However, NWP guidance shows the development of a sfc pressure trough originating from the Iceland low, which, in fact, is some kind of occlusion point cyclogenesis and completely independent from the aforementioned upper PV anomaly/secondary trough. In addition, reinforced LL CAA behind the sfc low which is maximized just below the upper level PV anomaly underlines the low cyclogenesis-potential of that feature. Summarising all the stuff, there are two nearly decoupled features: the sfc low and the upper PV anomaly. This dynamical constellation makes the overall setup quite complex. On the western flank of the ridge, an unstable airmass spreads NE-wards over western Europe during the night, reaching Germany in the early morning hours. As GFS strongly overestimated the BL moisture today over France (Trappes: dewpoint forecast: 20 °C vs. measurement: 15 °C ), we do not trust in the exceptional CAPE values of up to 3000 J/kg that GFS forecasts for tomorrow. We think that 1200-1500 with peaks up to 2000 J/kg (where moisture pooling occurs) are more realistic. We also refer to ECMWF and ARPEGE concerning this point. 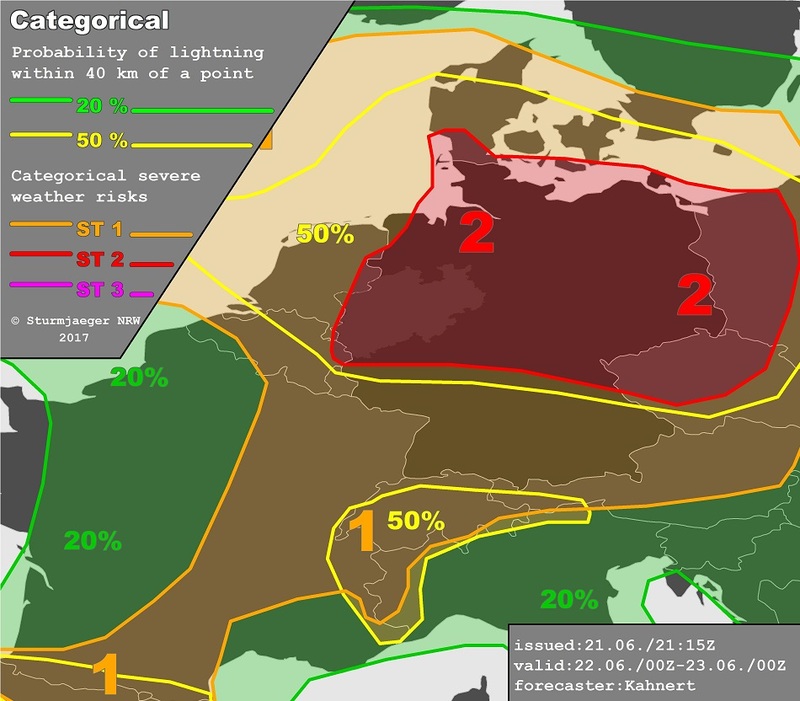 According to the general NWP consensus, first DMC is likely in the morning hours over northern Germany which is linked to the occlusion point sfc low. In a small corridor (mainly over Mid Lower Saxony), WAA-generated 0-3 km SRH coincides with increasing CAPE around 1000 J/kg. Here, e.g. EURO 4 or WRF 4 km simulate a well defined MCS. Although such a system might be elevated, BL rooting cannot be excluded. Then, the system may quickly become severe capable of producing severe to locally damaging wind gusts (if a strong cold pool develops) and heavy convective precipitation. Although the hail risk is reduced in the early daytime, we cannot exclude a large hail event as well. Regarding Corfidi vectors, the MCS will translate towards eastern Germany where further intensification is questionable due to missing CAPE. Nevertheless it has to be mentioned, that EURO 4 simulates a strengthening of the system. Behind the MCS, broad subsidence is likely and will initially suppress convection over northern Germany. Additionally, LL advection of pseudopotential colder air behind the sfc trough will additively support CAPE reduction over NW Germany, what is shown by nearly all models. Here, the further convective development is most questionable. To the south, over North Rhine Westphalia, S Lower Saxony, Hesse, Saxony Anhalt, Thuringia and Saxony insolation and strong capping will result in a loaded gun setup with the aforementioned CAPE values. 0-6 km DLS increases over the day with maxima of 22 m/s in afternoon. As the upper PV anomaly approaches in the afternoon/evening, QG forcing in terms of DCVA gets a subject and rapidly reduces CIN. A moisture return is also likely over NW Germany as a consequence of the anomaly’s teleconnection to the surface wind field. 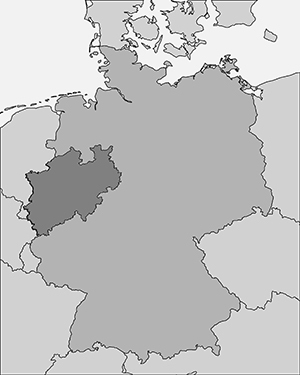 A line of DMC is forecast to arise somewhere between the German/Dutch border and the Sauerland/Teutoburg Forest, subsequently shifting very fast to eastern Germany. In NE Germany, CI is more questionable and depends on the amount of CAPE that may build up / re-build up after the morning-MCS. Depending on the actual stability/CAPE values, shear vectors and local effects (old outflow boundaries, mountain ranges), storms may rapidly cluster into a squall line / linear MCS or stay longer in a single-cell mode over some time (before finally merge to a line, too). In both cases a severe weather outbreak is likely. Severe to damaging wind events (microbursts are likely due to delta-theta-e > 20 K), large to very large hail in excess of 5 cm (steep ML lapse rates up to 7 K) and local flash floodings are the main threats. Although tornadoes are possible as well, a generally high LCL hampers the development of cloud lowering/low level rotation. 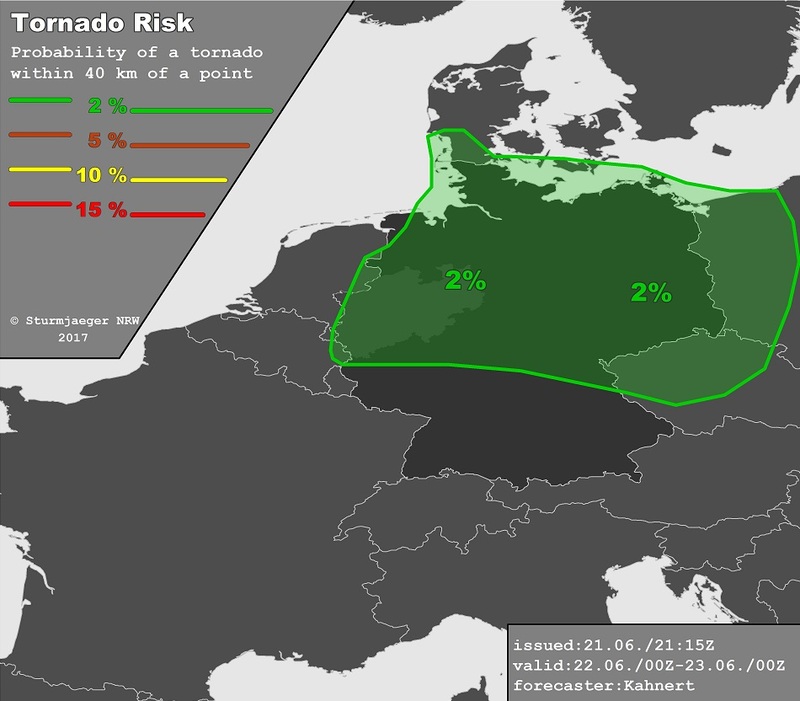 We finally decided to issue a broad severe threat 2 for most parts of northern Germany and parts of extreme W Poland. If there is a more distinct parameter overlap a wide spread damaging wind event is possible (derecho), but at the moment we do not think so. Over the southern half of Germany, isolated multicell storms may initiate in the early evening hours (when CIN is minimized) primarily along mountain ranges. The main threats will be large hail up to 5 cm and isolated severe wind gusts. Isolated storms will fire up in phase with day time heating along the Pyrenees within a moderate CAPE/ low shear environment. Main threats will be heavy convective precipitation and large hail.